Remember when those gigantic VR treadmills were all the rage a few years back? Cybershoes are like kind of like that, but without the treadmill. Cybershoes straps ski-like sleds onto your feet, with rollers on the bottom that track where you’re moving, and in what direction. That lets you physically shuffle around while you’re sitting in a chair to digitally run around in games like Doom VFR without needing to devote a massive amount of floor space to a VR treadmill. It’s a cool concept that works as advertised, and the shoes slip on very easily. Unfortunately, using Cybershoes made Hayden feel queasy, and he’s a VR veteran of many years and even more headsets. 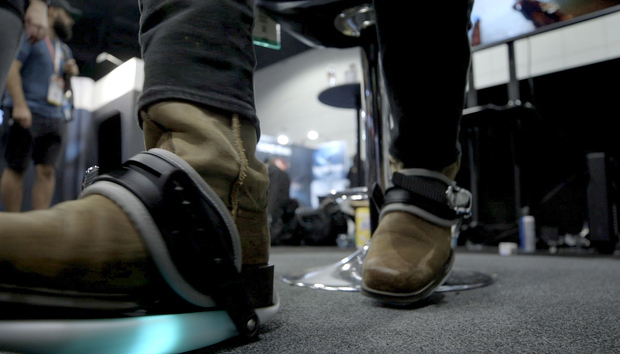 Watch him scoot through the hordes of Hell in the video above—our last of E3 2018—and look for Cybershoes to launch on Kickstarter in September.